"One side features memory foam infused with gel for its cooling properties." "All your dog needs to do is step onto the pad for it to start its cooling action." "The bed itself resembles a sofa and has a built-in bolster that provides extra support." "This slim mat has a durable canvas material on top, with an interior pocket that holds a pouch that can be frozen (or microwaved)." "Unlike denser foams that absorb water and also retain heat, this cooling pet bed has “noodle”-like foam that is waterproof and retains shape." "Resembling a cot for dogs, the Coolaroo has a platform made from high-density polyethylene, a breathable material that allows for excellent airflow." "This cooling dog bed works by using water’s natural properties to absorb and dissipate your dog’s body heat." The Memory Foam dog bed from Stella Beds is our top choice for a cooling dog bed that is also a comfortable and practical choice for your canine companion. The Stella Memory Foam pet bed is made from high-quality 6” thick foam. One side features memory foam infused with gel for its cooling properties. This side features an all-cotton cover that further assists in the breathability and cooling properties of this bed. The other side is soft and supportive egg crate foam (topped with an inviting Sherpa covering) that will keep your dog warm on chilly nights. Another thing to love about this cooling dog bed is that the cover is machine washable — making clean up easy. This bed also has a waterproof liner to keep liquids from seeping into the foam center. 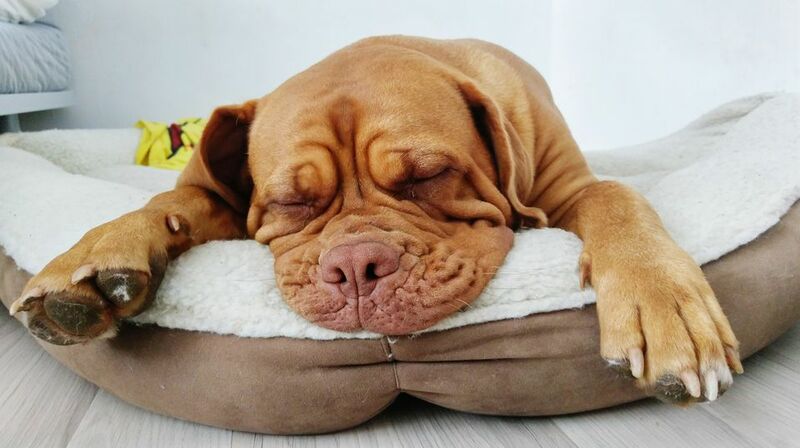 Overall, pet parents say that their dogs seem very happy with the Stella Memory Foam dog bed — and many have given up laying on the hard floor or asking to sleep in their owner’s bed! So for a cooling dog bed that is comfortable and supportive, choose the Stella Memory Foam Dog Bed. For a cooling dog bed that won’t eat up all the treat money, check out the Green Pet Shop Cooling Pet Pad. Offering your dog up to four hours of cool relaxation, this pet pad doesn’t require ice packs or any other mechanism to function. Instead, the pad is made from gel material that absorbs body heat from your furry friend. All your dog needs to do is step onto the pad for it to start its cooling action. This makes it a popular choice for dogs that are just returning from a walk and looking to cool down, or for providing a little relief on a warm summer afternoon. The Green Pet Shop Cooling Pet Pad is also easy to clean and is machine washable. It can easily be folded up for storage or travel. While this is not the plushest pet cooling bed, it is an affordable way to give your dog a cool place to lay his head. If you share your home with a large breed dog, then you need a cooling dog bed that will fit the needs of a super-size canine. The iComfort Sleeper Sofa Pet Bed is a popular choice for big dogs. The iComfort Pet Bed features memory foam with an open cell technology to assist in heat distribution. It also is infused with gel beads that provide cooling properties to keep your dog feeling comfortable. The bed itself resembles a sofa and has a built-in bolster that provides extra support. Pet parents comment on the fact that this particular cooling dog bed seems to hold up exceptionally well to the weight and activity level of a large dog. The bed doesn’t sag and holds its shape extremely well. It also seems to have escaped the destruction of many bed-shredding canines, maybe due to its outstanding comfort. If you need a cooling dog bed that won’t sag and will stand up to the demands of a large breed dog, pick the iComfort Sleeper Sofa Pet Bed. If you’re looking for a cooling dog bed that has a removable insert you can freeze to keep your furry friend cool, then the CoolDog Pet Ice Mat is the right choice for you. This slim mat has a durable canvas material on top, with an interior pocket that holds a pouch that can be frozen (or microwaved, if you’re looking for heat). Once the pouch is cooled down, simply insert into the Pet Ice Mat, and place it on the floor for your hot dog to enjoy! You can either wipe this cooling dog bed to clean it or place it in the washing machine. It does, however, need to be air dried. Users, like being able to provide icy cold relief to their dogs and cooling pet beds with an actual ice pouch, are hard to come by. However, one pet parent felt that the Pet Ice Mat allowed the frozen pouch to melt relatively quickly. Still, for an affordable option with an actual ice pack insert, the CoolDog Pet Ice Mat is a great choice. If your canine companion loves to be outside as much as he does inside, then you need a cooling dog bed that can stand up to both like the K & H Comfy ‘N Dry Pet Bed. Your dog will appreciate the ample airflow and circulation provided by the unique foam filling of the Comfy ‘N Dry Pet Bed. Unlike denser foams that absorb water and also retain heat, this cooling pet bed has “noodle”-like foam that is waterproof and retains shape. A mesh center ensures that body heat is quickly dissipated away from the bed’s surface. What makes this a great choice for an indoor and outdoor cooling dog bed is the ability to wash it off using a garden hose then letting it air dry. Or, throw it in the washing machine for a more thorough cleaning. Either way, you won’t need to worry about mold, mildew or lingering odors sinking into the foam of this bed. If your dog prefers an elevated bed, the Coolaroo Pet Bed is the best cooling dog bed for your pooch. Resembling a cot for dogs, the Coolaroo has a platform made from high-density polyethylene, a breathable material that allows for excellent airflow. The design of the bed also promotes a cooling action, since your dog will enjoy ample circulation below and around the bed — unlike traditional beds that rest against the floor. This bed has earned nearly 11,000 rave reviews and pet parents and pups alike approve of the bed’s comfort level and design. It is also a great choice for dogs that like to spend time in the yard or on the porch, but have issues with insects or bugs biting. The Coolaroo sits off the ground, reducing the number of pests your dog will encounter. Give your dog an elevated view while he chills out with the Coolaroo Pet Bed! If you are looking for a cooling dog bed that uses water to keep your pet from panting, the K & H Cool Bed III is a top choice. The Cool Bed III has a water pouch inside that you fill and replace back inside the bed. The manufacturer suggests that you will likely only need to fill this pouch once. If you plan to store the bed for an extended period of time (like during winter when temperatures are already chilly), then you may not need to refill the water pouch for a long time. This cooling dog bed works by using water’s natural properties to absorb and dissipate your dog’s body heat. Many dog owners say that their canine companions found the Cool Bed III to be effective and comfortable. You can also adjust the amount of water in the pouch to make the bed more or less squishy. A small percentage of people experienced water leakage, but often this was due to human error or an occasional defect that was promptly replaced by the company. All in all, the Cool Bed III is a unique way to use the simple properties of water to keep your pet cool.